When the corpse Dr Adam Bascom trips over in a country churchyard proves to be a senior clergyman, he expects a serious inquiry to follow. Instead, it looks as if the death is to be left unsolved. Why did the authorities try to stop him raising questions? Why was the dead man’s family so uninterested and the church determined to look the other way? Adam won’t let this unlamented death be ignored. He may have no expertise and no personal stake in the matter, but he’s still determined to get to the bottom of it. Thus begins a journey demanding take more effort and determination than he expects, a journey ending with a wild midnight ride to the bedside of a dying man needing to unburden himself of the secret that has plagued his whole life. 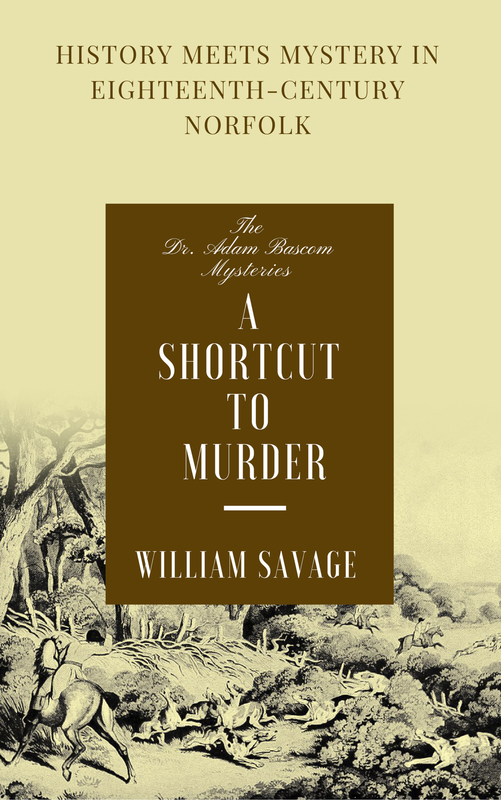 Murder and mystery return to the life of 18th-century gentleman physician, Adam Bascom. Bored with the tedium of his country practice, Adam finds himself called urgently to Norwich to treat a young man assaulted and left with total memory loss. Other mysteries follow thick and fast. What caused the man to walk alone, at night, along the deserted river bank? Who murdered a King’s Messenger and dumped his body in the river? How did a file of secret government papers go missing and how could a local miller have been killed twice in quick succession? 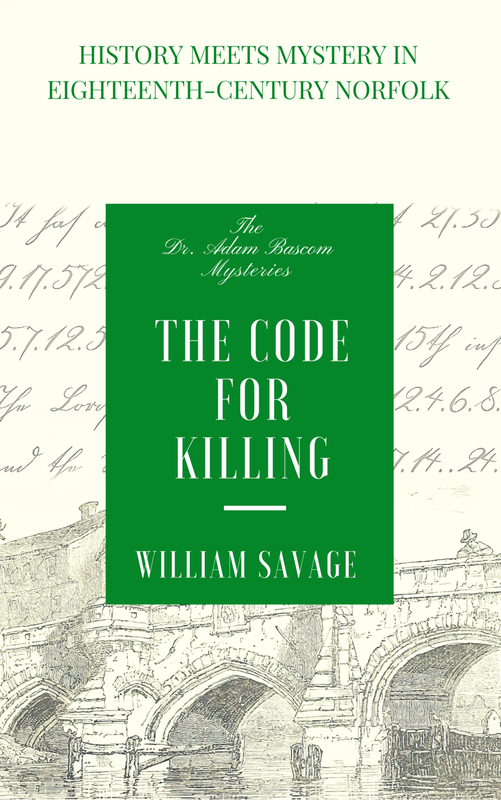 Helped by his friend Peter Lassimer, his mother’s companion Sophia LaSalle and a cast of characters old and new, Adam must disentangle a mass of lies, intrigue and deception to discover the meaning of “the code for killing”. 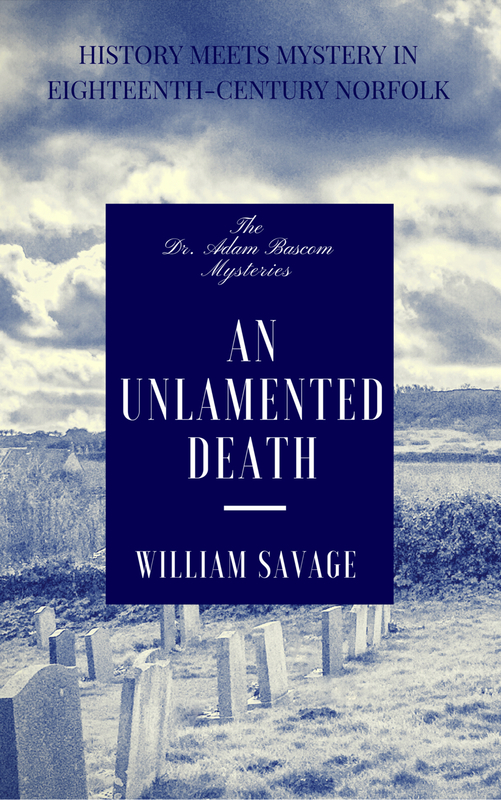 18th-century Norfolk physician Dr Adam Bascom longs to get back to his medical work. Fate, however, is determined to keep him off-balance. His magistrate brother Giles is called upon to investigate the death of Sir Jackman Wennard, rake, racehorse breeder and baronet. Did he die by falling from his horse in a hunting accident or was it a blow to his neck that snapped his spine in two? Why had he abruptly ridden off on his own in the opposite direction to everyone else, returned from yet another direction and died before he could rejoin the hunt? Faced with an impossible crime, conflicting evidence and the open hostility of the dead man’s son, Adam turns once more to his friends and contacts to help him solve what he is sure was murder. As events plunge out-of-control towards a fatal confrontation between past and present, can Adam move fast enough to solve the murder and prevent yet more lives being put at risk? The night of April 13th, 1793 proved unlucky for at least two people. Dr Adam Bascom was thrown from his horse to lie injured, unconscious and alone on a remote country roadway. Barely a mile away, another man thrust the body of the young woman he had just murdered as far under a hedge as he could. Thus begins one of Adam Bascom’s most demanding and complicated mysteries. Trapped at home by his injuries, Adam must find ways to use his friends and family as his eyes and ears as he uncovers the solution to a series of local murders and a plot to destabilise the country as it awaits the threatened invasion by the French revolutionary government. I am really enjoying the Adam Bascom series! I waited and waited for book 4 to appear. I bought it via kindle, and then tried my hardest to read some of the other books sitting there waiting to be read. Yesterday I gave in, and finished it this afternoon. So now, I’ll be waiting for book 5! You have laid enough trails by the end of it, that I guess you already have ideas for one or two more adventures? I do hope so, as there are so many plot developments for all the usual characters! I’m delighted that you like Adam Bascom so much and I don’t mind at all that poor Mr Foxe doesn’t work for you. They’re very different characters, so it isn’t so surprising. That’s deliberate. I don’t want either series to get stale and repetitive. Yes, I do have several ideas for future books ‘starring’ each of them. It will be a Foxe book next, I’m afraid, then probably book 5 of the Bascom series after that.